Jeffrey Drazen and the Barreleye Fish | WhaleTimes, Inc. I shared a few questions with Dr. Jeffrey Drazen, a biologist who studies deep-sea fishes. He was kind enough to answer them to help us understand and appreciate this little incredible fish. Is the barreleye fish a newly discovered fish? JD: We have known about this fish for many years. However, most of the specimens were caught in trawls which damaged the specimens. The transparent dome on its head is a recent discovery made possible by using cameras and ROVs to observe the animals alive. Dr. Drazen, what in the heck is going on with the spookfish’s head? Since I can see through its head, can I see it thinking? JD: The transparent part is actually over the skull itself so nope you can’t easily see the brain. Transparent head? Is this the weirdest animal in the sea? Are their other transparent animals? JD: There are lots of transparent animals in the ocean. In the open ocean there are no rocks or seaweed to hide behind so being transparent is a great way to hide from predators. Baby fish, shrimp, and many plankton are transparent. Even some squids and, of course, the spookfish are transparent or have transparent parts of their bodies. Why should it win the ugly-beauty contest? JD: It may appear ugly but its beauty is in how well adapted this animal is to its habitat. Is this a common deep sea fish? Is it threatened or endangered? JD: This is not a very abundant fish but it is commonly found throughout the Pacific, Indian and Atlantic oceans. There are several different species. 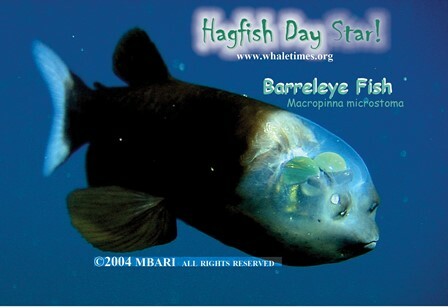 What is the most amazing thing about barreleye? JD: That it evolved a pair of very sensitive eyes and then overcame the narrow field of view by evolving a transparent dome. It can see and operate in extremely dim light – equivalent to a dark cloud covered night in the country. How can I help barrel eyes, hagfish, and other deep-sea animals? JD: You can help barreleyes and hagfish by reading about the them, watching wildlife shows about the deep-sea (like the Blue Planet series), and telling your friends and family about how interesting these animals are.